A question that surely all leaders of civic municipalities ask themselves when they are faced with budget cuts that far outstrip anything that has come before. The crisis of 2008, that is only now beginning to recede, caused havoc with the budgets of both cities and countries, and led to a reduction in spending that has left many services once thought sacrosanct, hanging on by a thread. However, even with less money, the populations of cities keep on growing, as populations chase opportunity to work and also for the betterment of their lives. The question, as always, is how to keep the civic life of a city alive while painful restructuring continues apace. Looking for external investment is one way to find the necessary capital, but in this respect many of the cities of the world are competing for the same ever-diminishing pot. However, capital always finds a way to the biggest possible returns, and the idea of the innovative city is one that is very appealing for investor, because, simply put, much of the technology that will be developed can be used horizontally across borders, and sizes, of cities throughout the world. This boost, the idea that what works in one city may very well work in another as well, means that capital is likely to seek out a home where it can grow. Take, for example, the gardeners of Barcelona making their rounds through the Parc del Centre del Poble Nou, who these days are as likely to be carrying tablets as trowels, pipes and hoses. This is because the city recently moved many of its irrigation points to an Internet-based system, which allows for full control and monitoring of the connected system. While it is useful for the city to be able to manage the water system at the swipe of a tablet keyboard rather than turning a knob on a pipe, a great deal of the advantage is in the data that the new system sends back to a central software system the city has built, where the controllers can have an overview of the entire system. The irrigation system is one of over 24 smart systems that the city is building to aid the progression towards becoming a smarter, more innovative city. Data from their sensors is processed by three open software platforms, where it is collected and analysed for insights as to how the city’s water system could be more efficiently run. 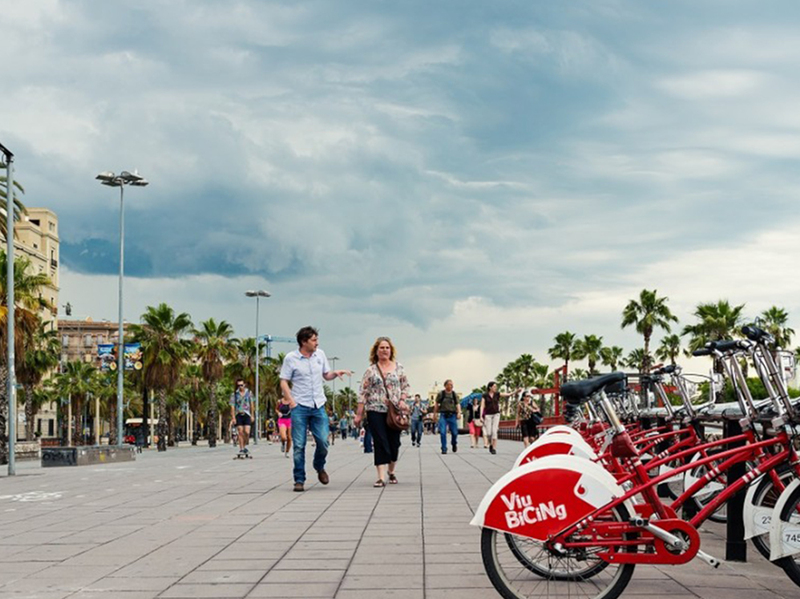 In the neighbourhood now called 22@Barcelona (but also known as Poble Nou), which was financed with around €184 million of taxpayer funds, the data is put to further use by creating apps and other programs to be tested in an ‘urban’ laboratory for smart city technology. As regards Barcelona’s irrigation system, sensors in the ground offer live data on humidity, temperature, wind velocity, sunlight, and atmospheric pressure. That means, for example, that gardeners can decide what the plants need based on that data and adapt their schedule to avoid over-watering. Residents of the city, or indeed, anywhere in the world, can check the data on an online map. The initial investment was around €300,000 in building the first phase, which was finalized in March. The city council estimated that the system would cut water usage by about a quarter, resulting in savings of €460,000 a year, a smart investment for a city that not too long ago had to import drinking water by ship from nearby regions when conditions became too hot, and local reservoirs began to fall to dangerously low levels. The Barcelona Open Challenge is another way the city is trying out new and innovative ways of improving the lives of its residents. The city challenged companies to create solutions for abstract problems that many cities face, such as over crowded streets in shopping areas and bottlenecks in the city, bicycle theft, and, a challenge to reduce social isolation. The latter is a challenge that may find uses throughout the world, as populations are growing older, communities are becoming more and more disparate as people move more often, which can often leave older residents isolated in their homes. To reduce this, Barcelona wants to look at how technology can be used to create a deeper sense of not only community, but also help older residents feel there is someone out there for them. In this regard, the City Council has found that the isolation and loneliness of the elderly have devastating effects on their health and quality of life, in that, for example, the effects of smoking on this section of the population, and in the case of Barcelona and Europe, the trend is upward. For this reason, Barcelona promotes the creation of a platform to strengthen the relationship between people who support the elderly, both in the formal framework, such as the care and health field, as the more informal one, through family, friends, neighbours and volunteers, so that they provide better care and reduce isolation. i2CAT Foundation was the winner of this part of the competition, and the Barcelona-based company, whose vision is to show ‘excellence in Research and Innovation in the field of Future Internet, and to establish itself as a reference partner at international level to lead its application in the principal economic, industrial and social sectors, developed a solution that could solve many of the ageing populations issues with social isolation. The solution proposed by i2CAT, named ConnectaBCN, is based on an open source multi-platform tool with communication, video and voice service capabilities, with social media benefits and video storage, with a calendar to support daily activities and manage appointments, an alert system, encrypted and secure storage of important documents and personal data, elements of health monitoring, and advice and training as regards the use of the tool. Additionally, the tool will have the ability to add new applications and functions of third parties as and when they are developed, so the tool can be adapted to the future needs of citizens. These two projects may not seem like they will change the world, or indeed the face of modern city administrations. However, if city councils can make savings, and improve water usage and also the lives of its elderly residents, then the path to create up-to-date and useful technological solutions to many problems cannot be far out of reach. That money can be saved in both of these areas and the services they provide improved, and by using technology shows that if the administrations of cities, and indeed countries, move with the technology and interpret problems they encounter in a 21st century way, reduced budgets need not necessarily mean lower quality. Just ask the plants of Barcelona how they feel.